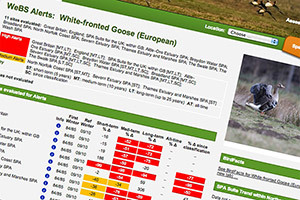 The WeBS Report Online interface allows the viewing of the latest and historical data for WeBS Alerts, the Non-Estuarine Waterbird Survey (NEWS) and the Annual WeBS Report. Each area or tab of the interface returns data available after you select a species or location to filter by. This element of the interface complements the summary report by provinding comprehensive recent and historical sites and species data from WeBS Core Counts and supplementary data, in the form of annual maxima, national species totals, national species indices and trends and flagging of important sites. Navigation is by searching for a site ("location") or choosing a species from the drop-down menu. This element of the interface complements the summary report by giving maps and tables for key species for estuary locations. Navigation is by choosing a site from the drop-down menu and then selecting a species to map. supporting documentation contains detailed descriptions of all the tables, statistics, maps and plots presented; the methods used to produce these; and important interpretation notes. 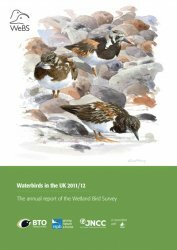 The Waterbirds in the UK summary reports also contain additional data and interpretation. The WeBS Alerts report is a periodic report that is part of the BTO research report series. The results of the latest report are represented by the WeBS Alerts tab in the WeBS Online Report interface. The purpose of Alerts is to indicate the status of waterbirds on two types of protected sites - SPAs (Special Protection Areas) and SSSIs (Sites of Special Scientific Interest) - that are designated for their waterbird features. 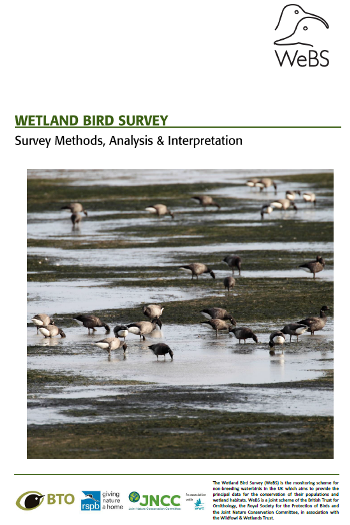 The Non-Estuarine Waterbird Survey (NEWS) is a comprehensive periodic survey of the non-estuarine coast, which covers the part of the coastline less well covered by WeBS counts. 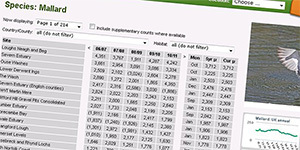 This tab includes maps of counts and tables of regional open coast population estimates for the surveys which took place in 1985, 1997/98, 2006/07 and 2015/16. Navigation is by choosing a region from the drop-down menu and then selecting a species to map. We have produced a short series of Youtube videos to guide you through different aspects of the WeBS Online Report interface. Watch the introduction video below, or watch one of the other videos available on a specific aspect of the interface. View some commonly asked questions - but if you cannot find an answer to your query or have feedback about the report, please contact us.